Writing is the second most solitary occupation. Science writers are perhaps even more isolated given that their topic is outside many people’s comfort zone. But individuals with a talent to explain are in demand. In a culture that values personality over ideas, writers who can tell a story and open readers’ eyes to the wonder around them can stand out. Unfortunately, the writer’s path is “very seldom a path to riches,” as this handbook admits up front on page four. Or “A great story can take years to build.” Such harsh truths pale beside the gems contained in its pages, however. Inside are lessons that would take years to discover on one’s own. In discussing contract literacy and rate negotiation, for example, two magic questions alone are worth the book’s price: “Can you raise my rate?” and “Do you have a better contract?” Sounds obvious, but few people know how to ask and, more importantly, when to ask it. Bullet point summaries end each chapter, which is good because there are too many useful pointers to remember. Editors’ names, submission leads, and resources are generously sprinkled throughout the text. You’ll want to take notes as you read. Whether you are breaking into the field or a seasoned professional, this book is dense with advice from the SciLance workgroup, which boasts 225 years of combined experience. In each chapter, a SciLancer (short for science freelancer) tackles a challenge such as pitching, time management, working with editors and their edits, how to use social media, dealing with rejection, and treating your writing like a business so you can actually make a living at it. They capture the drama inherent in science and the fascinating individuals who create it. Like Gaul, the book divides the writer’s life into parts. 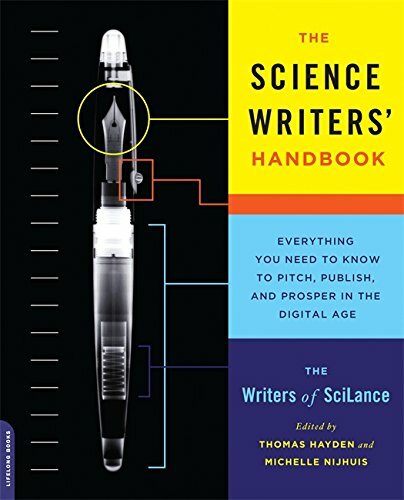 Part I, “The Skilled Science Writer,” addresses quality writing—how to find and pitch stories, find a hook, translate technical sources into clear prose. It distinguishes between topics and stories, and breaks down the elements of a successful pitch (a pitch is reported just as your story is). Amusing but useful sidebars include “Classic mistakes we can all avoid,” and tactical tips such as making sure you compile a quick list of questions so you have something to fall back on when you lose your train of thought (believe me, you will). There is even a chapter on statistics and why understanding it enhances your credibility by letting you poke holes and pose incisive questions. Another chapter distinguishes creative procrastination, which helps you figure how to shape a coherent story that flows, from the destructive kind we all face. Part II, “The Sane Science Writer,” shares lessons in balancing work and life, meaning kids, pets, and working from a home office. Writers often need to deliberately mix in socializing, because left alone they’d be content being the guy behind the door. Get out, network, use social media. It’s work, sure, but it pays off. “As a writer, even one who’s just starting out, you have a license to invite yourself to all sorts of interesting events.” Follow your nose, dive into holes. All writers face rejection. The New Yorker, for instance, gets a zillion pitches and has a limited number of slots. Editors are conservative and pick stories they know will work over those that only might. They could be reject you for any number of reasons. What are you going to do when the answer is no? Finally, to answer the question you’ve been dying to ask, the foremost solitary occupation is lighthouse keeper.